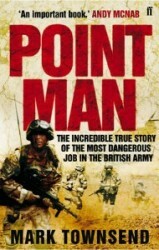 The point man is the first to encounter these signs of danger. He’s the soldier who leads the patrol into battle. Between 2007 and 2008, 20-year-old Kenny Meighan was the longest-serving point man in Helmand province. An exceptionally skilful and brave private who came from a family of soldiers, he was lucky to stay alive. This is the true story of how Kenny took on the toughest test a soldier could face and lived to tell the tale. What's so good about Townsend's account – quite apart from some meticulously captured action sequences – is the way that Kenny and his dad emerge as far more than symbols. They are flesh and blood.